More and more multinational companies are deploying key employees around the globe to serve the increasing international business needs of the multinational, its global markets, and its customers. The ability to relocate employees quickly from one location to another, and the ability of those employees to quickly focus on the business objectives of the company once they are relocated, can often determine the success of a new regional operation or an entire global strategy. It is crucial for employers to avoid unexpected barriers or difficulties in the form of employment-related issues. This enormously valuable handbook is the ideal solution to such problems, both in the anticipation and in the event. With 32 chapters each written by local experts, it provides a practical, country-by-country guide to employee relocation issues among the world¿s most active or fast-developing economies. 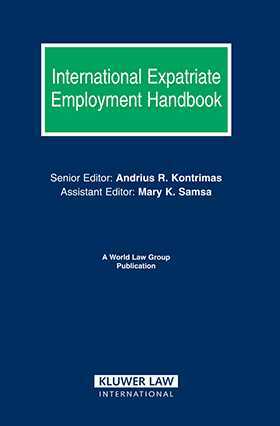 Each chapter offers a handy reference to relevant issues under each particular country¿s laws regarding employment status, compensation and benefits, related tax issues, and more. With its reliable guidance, both employers and employees can proceed confidently with their cross-border plans and commitments. protection of confidential or trade secret information. The Handbook has been meticulously produced under the auspices of member firms of the World Law Group, a leading network of 48 independent law firms located in most of the world¿s major commercial centers. A peerless source of information and guidance to employers in expatriate relocation planning, it will greatly help to foresee potential pitfalls and benefit from local advantages, so both employers and expatriate employees will be free to concentrate on the business goals at hand.